Yoga Accessories, LLC operates as an online retailer that manufactures and distributes yoga products and accessories. The company operates three web portals namely www.yogaaccessories.com which focuses on direct to consumer sales of Yoga products and apparel, www.yovedic.com which focuses on sales of the best wellness and holistic living supplies and www.yogoria.com the largest on-line directory of yoga studios. The company was incorporated in 2007 and is based in the United States. 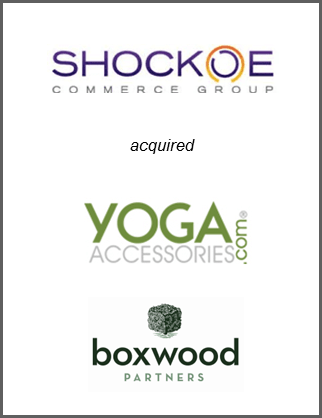 Shockoe Commerce Group, LLC a portfolio company of Boxwood Capital Partners, acquired second leading ecommerce yoga products retailer Yoga Accessories. This acquisition complements Shockoe Commerce’s acquisition of Yoga Direct last month, and positions the company as a leading supplier within the attractive and growing yoga products market.